Posted June 18, 2015 by Emily Adams . In my inbox, my facebook feed, my Google searches… companies are sending personalized messages, wishing me a happy birthday. A yoga studio sent me a gift card for a free class. A clothing store emailed a personal discount code, good for the entire month. A text message from my dentist wished me a Happy Birthday. 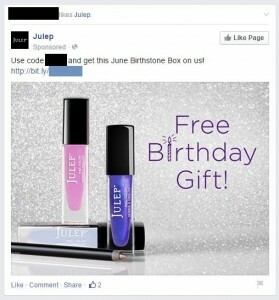 A Facebook ad offered a “Free Birthday Gift” package for liking the page. A card from my insurance company shared messages and signatures from everyone on the staff. Each of these is an example of specific, targeted advertising online. And with so much information available, it’s not hard to determine how they are doing it. With email marketing, it’s easy enough to create a personal message – incorporating details from your customer database, like name and birthday, to craft a unique message just for a single person. Facebook allows you to tailor ads to specific groups, only showing to people who meet a certain criteria (say, with a birthday in the month of June). Brands can even reach out to specific people directly on social media, to send a personal birthday wish. Direct mail offers an even more personal touch – while it sometimes takes a little more effort for a handwritten note or signature, sending a “Happy Birthday” Card to a client or customer has a clear message. These personal messages grab your attention. You’re less likely to ignore a message that is meant for you. Not someone else, not just any customer, but specifically for you. After it holds your attention, these messages do something else that is much more valuable – they show you that the brand actually cares. They paid attention. They noticed your birthday. They sent you something special. They remembered you. They care about you. It worked for me. I’m betting it will work for your customers too. To get started crafting tailored and targeted messaged for your customers, call our team at 303-703-8000.